It’s not very often fans get to see a legendary classic rock band. As groups who rose to popularity in the 1970s hit that 40-years-later mark, most have retired, some have lost members and bitter break-ups have left the bands splintered. That wasn’t the case Saturday night as Fleetwood Mac played in a packed Sprint Center in Kansas City. It was the group’s 71st performance on this tour, which kicked off Sept. 28. It was all the more special because Christine McVie, whose keyboard and vocals helped anchor the group, returned to the band for this tour after retiring in 1998. It was also a special moment for me, as the concert was a birthday present to my mother. While she has been a fan and idolized vocalist Stevie Nicks since she was a teenager, she had only seen Fleetwood Mac once in 2001. With the reunion, it was the first time she’d seen the full lineup, and for our family it was seeing one of the many classic rock bands whose music my parents blared when I was younger live and in person. The show was nearly two and a half hours long and the group played what could have been a greatest hits album for those in attendance. The show kicked off with Mick Fleetwood hitting the opening note of “The Chain” and the crowd screaming to their feet. The live versions of their catalog were really impressive. McVie had her accordian out for “Tusk,” and Nicks was doing her signature gypsy dance throughout the show with her shawl held carelessly behind her. 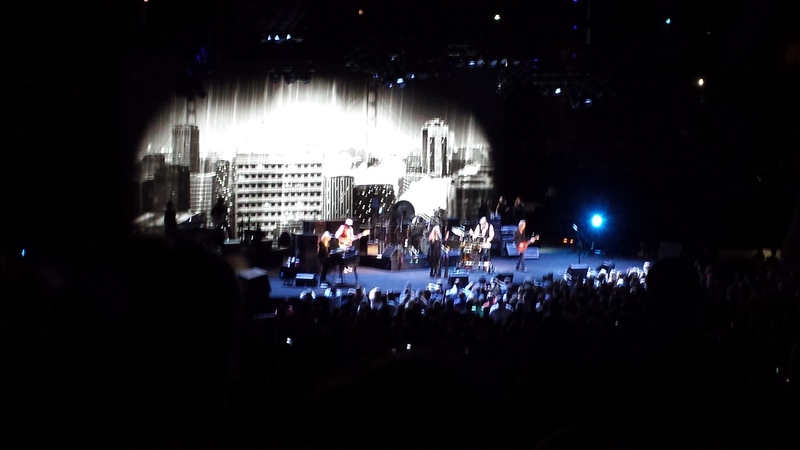 Lindsey Buckingham, who I’ve never thought of as an amazing guitarist, poured it on throughout the show. Midway through the set he performed “Big Love” solo on an acoustic guitar and then was joined by Nicks for a mind-blowing rendition of “Landslide,” capped with the pair holding hands at the end. Nicks told a story about being a younger version of herself in San Francisco and walking into a boutique called Velvet Underground and not being able to afford any of the clothes in the store. She said it was her motivation to follow her passion and pursue a career in music. Late in the show, Buckingham noted that a lot of the songs played were older than a lot of those in attendance. The group played eight songs from their legendary album “Rumours,” which released in early 1977. While the vocalists, most noticably Nicks, don’t have the same young voices they had on their recordings, the music transcends generations. The band’s dynamic sound – anchored by three distinct vocalists in McVie, Nicks and Buckingham – is only a small piece of the pie. Fleetwood was a magician on the drums, opening the encore with a rousing drum solo that fully displayed his skill behind the kit. Comparing it to pop music of today, I was floored. Considering the band has been doing it for more than 40 years, the way they interact with each other and the crowd throughout the show puts a lot of present-day pretenders to shame. A few of the performances that really stuck out to me were Buckingham’s solo rendition of “Big Love;” it was like he was in his bedroom by himself letting loose on the acoustic. The down-tuned guitar riffs throughout “Gold Dust Woman” really caught my attention as a fan of heavier music. And the final song of the night, the infamous B-side track “Silver Springs,” was a beautifully-played masterpiece and really a showpiece to why the group has withstood the test of time. It was a magical night, and one those in attendance won’t soon forget.